The vast majority of Linux users who want to create vector graphics will commonly use Inkscape. Now, meet the Inkscape competitor, Gravit Designer. What is that? Gravit Designer is a free vector graphic software just like Inkscape. The difference, it also has a functionality as a desktop publishing tool much like InDesign. We are not going to talk about Gravit Designer too much here. You can read this post if you haven’t heard about the tool before. Gravit Designer is a cross-platform app which is available for Linux, Windows, macOs and web as well. 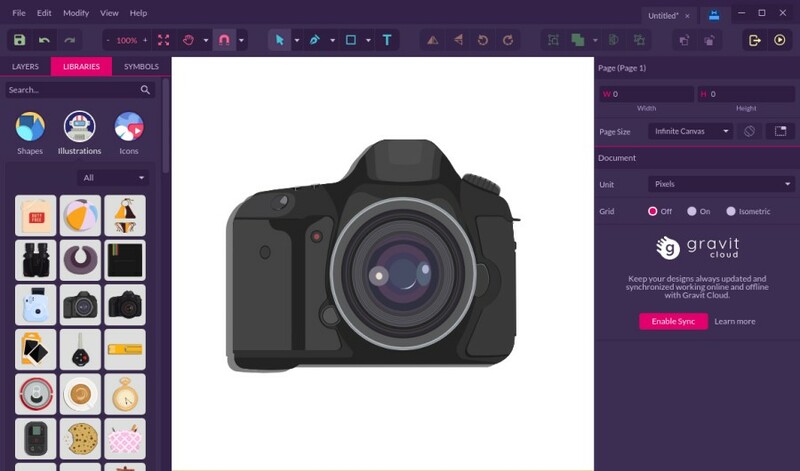 For the Linux platform, the developer of Gravit Designer provides two packages: generic and snap. In this article, I am going to demonstrate how to install Gravit Designer using the generic package since it works on (should be) all distros, while snap is specifically developed for Ubuntu. First off, you can download the generic binary package of Gravit Designer here. Once the package is downloaded, run the following steps. Extract the zip package of Gravit Designer. Open terminal and get in to the extracted folder from step above using cd command. Copy the binary file of Gravit Designer to the “/opt” directory. You need a root access to copy the file to the “/opt” directory so don’t forget to add the “su” prefix on your command. Go to the “/opt” directory and set the executable attribute to the binary file of Gravit Designer. A pop up dialog will appear, asking you if you want to integrate /opt/GravitDesigner.AppImage with your system. Click the Yes button. If you click no, you will only be able to launch Gravit Designer via terminal (or double-clicking the binary package), which is very hassle. In some case, you might need to restart your computer before the changes is applied on your system.